Speedy Tuesday is here! This time we show you something special that one of our readers sent to us. 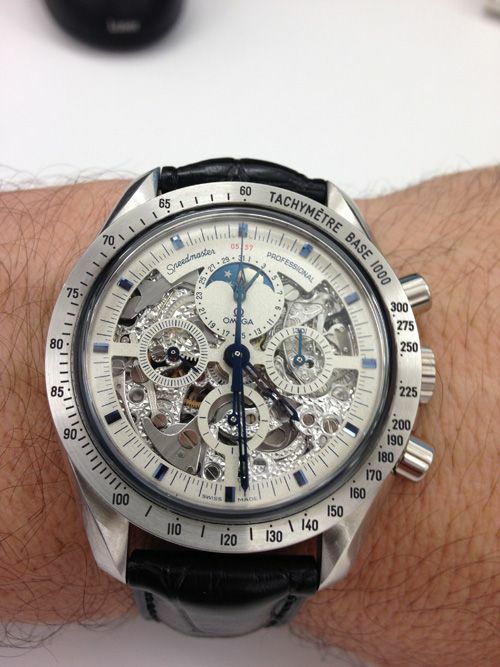 Chris from Australia sent us photos of his Omega Speedmaster Professional Moon Phase Skeleton. A platinum Speedy Pro that Omega created in 2003 together with master watchmaker Armin Strom. 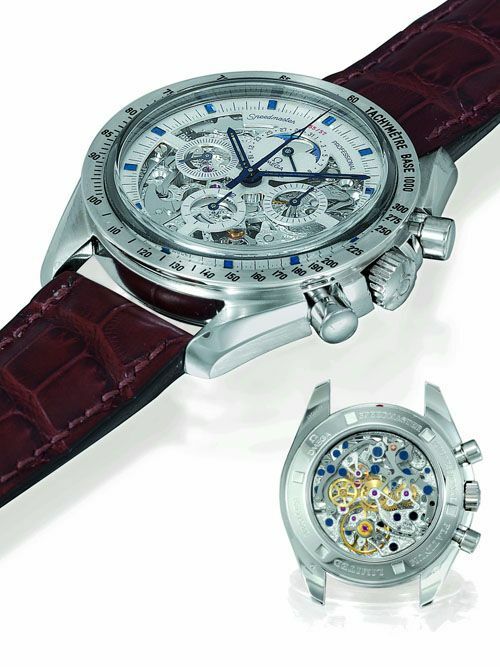 Armin Strom is well-known for his skeleton and engraving work and is responsible for this beautiful hand finished ref. 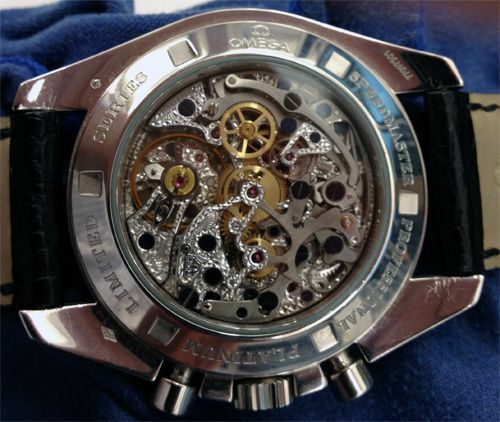 AT145.0058 Speedmaster movement caliber 3604A. This movement, based on the Lemania 1884 is the skeletonized version of the Lemania 1874. A movement we’ve seen in other Speedmaster Professional Moon Phase watches as well, being Omega caliber 1866. Only 57 pieces have been made of this skeleton Speedmaster Professional in platinum in 2003. As we wrote earlier on this 25th anniversary Speedy Pro Chronometer model, there also was a skeleton Speedy Pro in 1994 to commemorate the Moon landing in 1969. This platinum 1994 version was also done by Armin Strom and was restricted to 50 pieces. Below, a picture of No 55 of this Speedy Pro Moon Phase Skeleton ref. 145.0058 that was auctioned by Antiquorum. The owner of this watch, Chris, bought this piece to wear it. So luckily, it is no safe queen. Look at the value of these platinum skeleton watches, we’ve seen ‘No55’ go during OmegaMania in 2007 for 70.800 Swiss Francs. Now, we all know the OmegaMania auction was far beyond any sense of reality, so we had a look at Chrono24 and noticed there is one for sale for $37,400 USD. Happy Speedy Tuesday everyone and a big thank you to Chris from Australia for sharing his Speedmaster with us. If you want to participate, send a few pictures of your Speedmaster to speedmaster@www.fratellowatches.com.